The Lincoln Exhibit in the Hawks Inn History Center opened for public viewing on Saturday, September 1st. Mostly recently displayed at the Gettysburg National Museum, Robert Lang’s impressive collection of 16 original Lincoln portraits, several sculptures and other Civil War memorabilia has been prepared for public display. 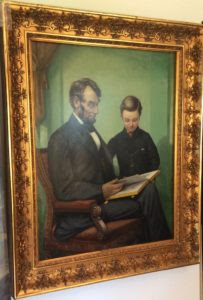 It is the largest private collection of original Lincoln portraits in the country. In addition to Lincoln, there are portraits of others important to the Civil War such as Generals Grant and Lee. There are 70 pieces on display, including Alonzo Cushing’s Medal of Honor, on loan from the Gettysburg Museum. At left: Lincoln looking at a book of Matthew Brady photos with his son Tad. Matthew Brady took the original photograph which became the basis for this and many other Lincoln portraits. Another, life sized painting of the president, once hung in the White House. The PBS program Around the Corner with John McGivern visited the Inn and History Center in July, and the exhibit will be included in the focus on Delafield to be shown on TV in January. The charge for viewing the entire exhibit is “two Lincolns”: $5 for adults and 1¢ for children 12 and under. The History Center will have this extraordinary exhibit through August of 2019.